People leave the PIT better people. Yesterday, I had the immeasurable pleasure of attending the Improdome show at the People’s Improv Theater on 123 East 24th street with my dear friend, Michelle. 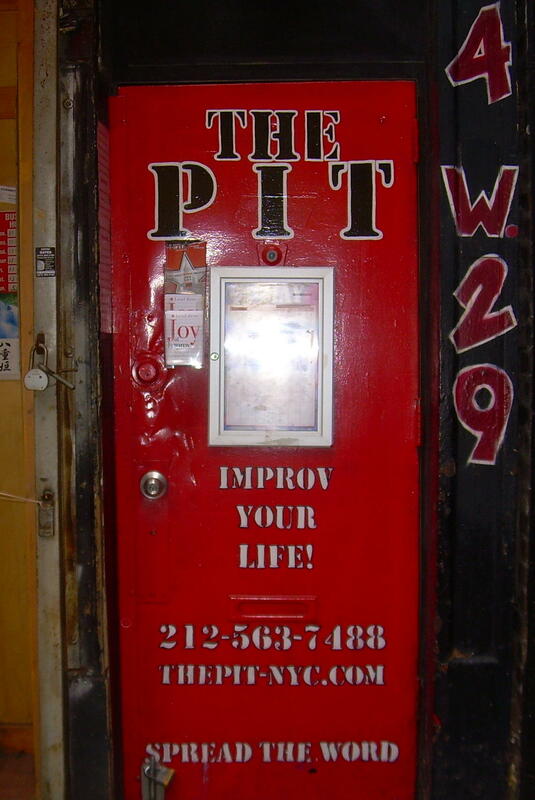 PIT truly lives up to its eponym, as the Improdome show allows for any audience member to sign up to perform improv in teams that are selected randomly during each show. On a high and on a buzz, I signed up to participate. I hadn’t done any improv outside of my tenth grade theater class and hadn’t performed in front of an audience in practically ever, but at that moment I was pretty sure I was the funniest man on the planet (Michelle particularly enjoyed my freestyle on the origin of my stage name, “Saleem Sauce”) so I wasn’t too worried. So we enter the theatre and watch the selected audience try to make us laugh. To our enjoyment (and my slight apprehension), these cads didn’t have to try. They listened to one another for their jokes, and conceived some of the most immaculate collaboration I’ve ever seen. SNL could have taken a chapter out of their books. What was great was, as opposed to some people who to walk onstage with their own spectacularly witty thing to say to get a cheap, whorey laugh (hi folks! ), they brought a ball and passed it around. And they said “Yes, and” alot. But what about those like me? Who are so wrapped up in their own minds, either by design or choice, that the mere act of joining in on a joke is a process in itself? Those who are perpetually confused by the muddled voices that are attempting to transmit to broken receivers? We, the deaf, the socially awkward, the impaired, the hesitant, are desperately trying to communicate but can only move along at our own pace. Can we perform improv? Can we let go of our fears of saying something stupid because we don’t understand what we’ve heard and bare our soul to make a Wednesday night audience laugh? I deeply worried about this for approximately fifteen minutes after the show. I mean, what good is improv if it can’t improve anyone’s life? But as I left with Michelle, shooting zingers about how obnoxious the How I Met Your Mother ads in the city have been lately, I came to the conclusion that joining in on jokes is only a rigorous process for those who are removed. It’s quite easy to say “Yes, and” to your dear friends, which means it’s quite easy to say “Yes, and” in any situation. All you need to do is forget that you are hesitant, even if you didn’t catch what was said. You don’t need ears to pass a ball around. Of course we can! We just need to take improv classes.